I received an email a few years ago—it was an unforgettably stunning email—identifying a photo from my book as the writer’s mother-in-law. This story—and every identifications is precious and unique to me—was quite different from any other, and its impact has never left me. My indirect involvement in this story started when Ken and Gloria Price had Friday night dinner with friends, and their host showed Ken a copy of my book, The Last Album: Eyes from the Ashes of Auschwitz-Birkenau. 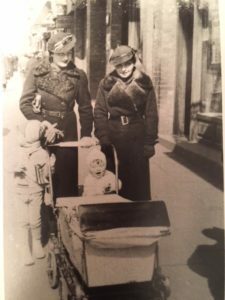 Ken immediately zeroed in on one of the first pages, a photo of two young women, a baby carriage and two little children. When he showed his wife, Gloria verified that it was, indeed, her mother. That would have been enough. As we say at the Passover Seder, ‘Dayenu’— it would be enough. But there was more, so much more. After seeing the book, Gloria took it to her mother the next day and showed her the picture. Sonia indeed recognized this unknown photo of herself, and the other woman, who was one of her closest friends, Lunia, (Lunia became like an ‘aunt’ or nanny to the children), and the two children, David and Lusia. 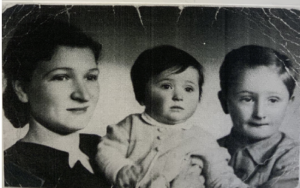 These innocent children, like 1.5 million Jewish children killed in the Holocaust, were murdered in Majdanek. Gloria ended her email by saying: “My mother died that night. This was her last precious gift to me!” I am still incredulous at these words. 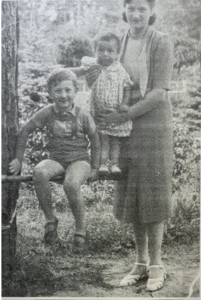 Here are pre-war photos of Sonia and her children, David and Lusia, in happier times. 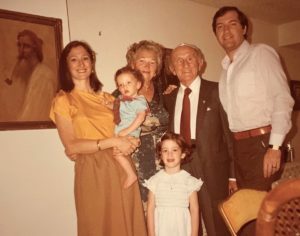 Here are Gloria and Ken Price, young parents with their son and daughter, and Gloria’s parents, Sonia and Abe Huberman.